I strongly think that there is only one strategy for network and it is your own. But there are some recommendations for helping and organizing your strategy. A contact is by definition any person that we know in our influence area that can be approached and have a conversation. They are basically known people. Within this range of known people there are some degrees of knowledge, from close friends to Nothing. Nevertheless in job search, a contact can be anyone that we can reach up to. Anyone that we know that exists. According to former paragraph, there are different levels of contacts, they can be classified. Level 1 is dedicated to family, level 2 friends, level 3 known people, level 4, 5 and even 6 unknown people. The good news is that there is a way (according to the Theory of six degrees of separation) that explains that on earth can be connected to any other person on the planet through a chain of acquaintances that has no more than five intermediaries.So you can meet anyone in the world, just need to plan it. Creating a network strategy goes along with the Strategy of approaching companies and targeting positions in the market. Therefore, considering that, one need to sit down on a sunday afternoon and create his/her own conspiracy agenda to meet the 4-5-6th person in the chart would hire him/her. I believe in adventures and I believe in enjoying networking. I believe in people giving right messages without annoying others, and I believe in people networking only for real. All these believes mean the following simple explanation: Do not ask for a job, meet people for the fun and helping them with a subtile intention of your adventure of finding a job. That means that the idea behind is giving a message of job search in two-minute conversation during a long one. So spend the rest 58 minutes of conversation helping the others. 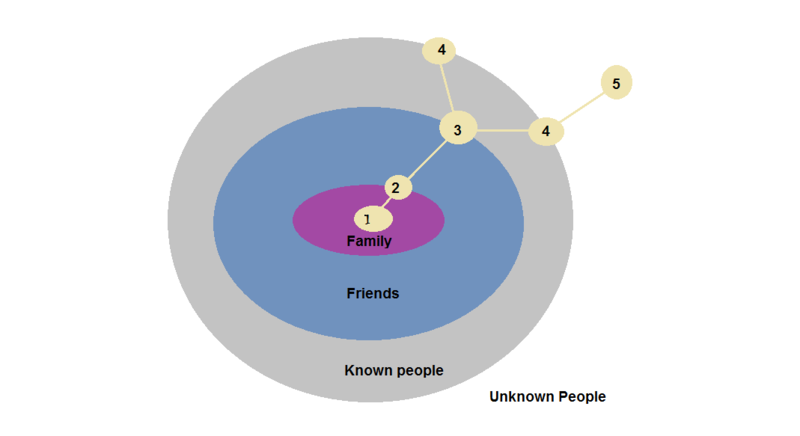 In order to simplify the classification of contacts one can easily create a chart with three columns on friends and family, known people and ex working colleagues and the third and most interesting, known people but not in person. Based on this basic criteria one needs to start thinking in which approach we would eventually contact these people. Friends and family are obvious, known people maybe and unknown personally how? My personal approach is with all the respect to your network people in mind, to create a strategy to contact them, very simple, write the name and then relation and the most difficult thing would be reason to meet. There you need to show respect to the contact and consider either a sentimental positive reason or how you could help this person (i.e. from professional guidance to finding a flat):… and here is where the adventure of meeting people starts !! enjoy it !! Actually comapnies shall act in ethical way. Instead of digging the expectations of the candidate, they shall define the salary range for the position. But many of them are not Professional. Mehmet thanks for your comments. I regret to read that about companies. Sometimes your contact person in hhrr does not reflect the rest of the company.